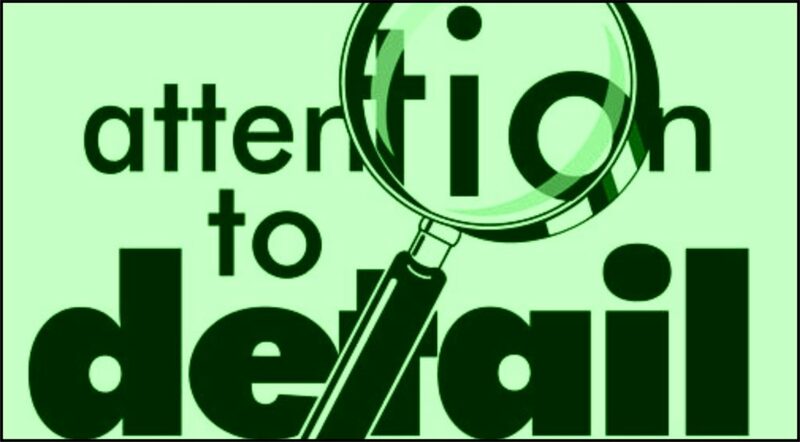 One of the things that really got under my skin as a Sales Manager, were the salespeople WHO THOUGHT IT WAS OK NOT TO PAY ATTENTION TO DETAIL. Their note taking was lousy, record keeping almost non-existent and follow-up was a thing they had to do rather than a vital sales exercise to ensure the total sales process was tracked and followed explicitly. I’ve even seen sales clerks and other back-up staff not take notes, or diarise important in-coming phone calls, or at other times, forget to inform the salesperson one of their prospect called while they were out. Sometimes those prospects were even wanting to place an order with the company, yet were stifled by uncaring people that should have known better. I’ve even consulted with companies where the Sales Manager, or business proprietor, were the main offenders and would forget things, then pass them onto the salesperson a few days later because they didn’t take notes or keep records, but relied on their memory alone. Unfortunately most of the prospects had gone cold by then, or had bought elsewhere. Here’s a word of warning to salespeople, managers, supervisors and support staff. If you tend to skim over details because you’re busy with other things and just don’t have the time to do things to the letter. You’ll create problems that may lose you a valuable client. If you’re a salesperson or a manager that thinks you can shortcut your presentation because you’ve done it so many times before that you’re bored with it, you’ll also lose sales. The professionals I know think of every presentation as an opportunity to create a new client, or to build on with an existing client. They know that every presentation is a new to their prospect and treat it with respect. Very few would do the same presentation the same way twice. A dear friend of mine, Brian Price, recently departed, once told me that in over 40 years of selling he believes he had never presented the same product the same way to two different prospects. And his closing ratio was awesome – right up to the time of his death. I know I wouldn’t pay him good money to advise me after reading that rubbish. I’ve always been taught, and go out of my way to teach others, that a presentation is not an ad-hock thing, it’s everything to the seller and the prospect alike. Salespeople should respect their prospect enough to do the necessary homework before they present to give themselves every chance to sell the prospect, and to also give the prospect every chance to buy. To do everything you do with enthusiasm and without shortcuts also carries over to your paperwork and ability to handle a computer – if your records are kept there and your orders are entered that way. Any missing information could cause your newly acquired clients to quickly lose faith in their decision and cancel the order. Then if you or your company don’t have the practices and policies in place to properly care for the expectations of your clients and prospects, you’ll generally find yourself working harder and harder to get new business. If that’s the environment you work in, then you become the benchmark the company needs to adopt. And they will, simply because your clients will expect the same standard from them. You become the one that invests some time and effort in laying out procedures that can be standardized and followed by everyone who works with you, and present this to your superiors if you need to. Salespeople shouldn’t promise anything above or beyond the company standard – and at times need to question company standards if they don’t change for the better over time. Then once a new standard is set, everyone should be expected to meet it, or exceed it. The highway on which a sale is usually built is wide indeed. If it wasn’t, very few would ever close a sale, and the prospect is extremely forgiving – too forgiving most of the time. Just think back to the calls you made where you believe you didn’t deserve the sale, but your prospect’s bought anyway. Prospects forgive everything except a wandering presentation. If you can’t stay on track, you shouldn’t be trying to sell. As a salesperson, you need to stay in control of every aspect of the sales process? Do you a script for your telephone prospecting; do you have a realistic formula that’s is adaptable in most circumstances for your on-road prospecting; do you have a carefully planned process for your presentations; and do you have an on-going way of ensuring your call-backs and follow-ups are effective. If you do, do you use them? And if you don’t, why don’t you? Checking to see if you’re on track only takes a few moments, yet, it’s one of the simplest ways to help you pin-point everything that needs attention. Once this is in place, whatever you do it’s likely you stay on track – and remain on track. This Article is by Peter Collins – In a sales career spanning more than 50 years, Peter Collins has focused on helping and bringing out the best in others – whether it involves training or mentoring salespeople, managers, business consulting to SME’s. Since the 1970’s Peter has built a reputation as a Nationally and Internationally Published author, and of the 130 books he has written over the past 48 years, Peter has 65 Business Books to his credit, (but he is mainly known for one book based on the Audio Tape series of the same name, Over 50 Ways of Closing the Sale). Peter also has written 23 Christian books. One of Peter’s books sold almost 2 million copies in the late 1970’s and is still selling well through second hand online marketers worldwide. In his personal life, Peter has been sought after as an encourager and motivator that has given of his time and talents freely despite his busy schedule. Subsequently, he has assisted churches, pastors, community and charity groups, as well as individuals through his teaching, training, development and on-going mentoring. © Copyright Peter Collins, Profit Maker Sales, Sydney, Australia, 2002, 2007, 2011, 2015, all rights reserved.